How can you find or highlight all cells having validation in Google Sheets? My spreadsheet has several cells that have had validation applied to them, but it would be nice to recheck them or switch the validation to a complimentary cell. After searching on Google and looking through the web page's GUI, it was not obvious how all cells having validation could be found. Is there a way to highlight or list all cells that have had validation applied to them? As I can see you need a report about all cells with data validation rules. 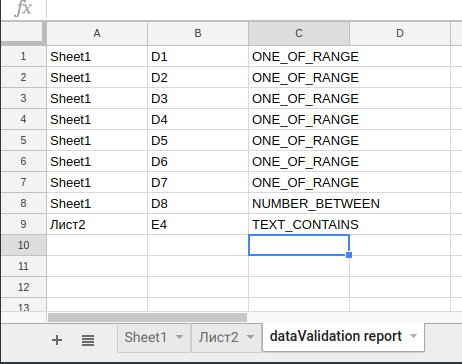 The next code creates the sheet with name 'dataValidation report' into the active spreadsheet and puts a little report to there. If the above indicators aren't shown, then you could use an add-on, Google Apps Script or the Google Sheets API to look for those cells either to apply some special formatting or to make a report of those cells. Not the answer you're looking for? Browse other questions tagged google-sheets search list google-sheets-data-validation or ask your own question. How do you automatically align incoming form responses in Google Sheets?